No matter how you slice it, Harper has failed to lead Canada towards a sustained economic recovery from the financial crisis seven years ago. It doesn't matter how much public money he spends on ads claiming otherwise. Facts are facts. So, what does a government facing re-election do when its top agenda item, economic management, is in tatters? It changes the channel to something else. By now, we've all seen the ads. You know the ones. Upbeat music is playing in the background. A man is busy at work in a steel mill. A woman pulls some piping hot buns out of a bakery oven. 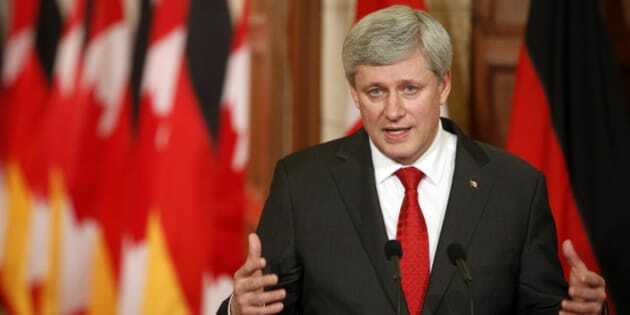 A pleasant sounding voiceover claims the Harper government is delivering "jobs, growth and prosperity" for Canadians. But there's a problem with that narrative: it's hogwash. Let's break this down. Jobs: Canada lost 4,300 of them last December and 33,000 the month before that, according to Statistics Canada. Target's decision to exit the Canadian market will lead to another 17,000 being lost. That's on top of the 1,000 people laid off by oil giant Suncor. Recent Statistics Canada data also reveals that our country's labour market performance in 2014 was extremely poor, with only 186,000 net new jobs created. The U.S. economy is roughly ten times larger than ours, and yet it experienced a 16 fold increase in net new jobs last year relative to Canada, at three million. What happened to Canada's economy being the "envy of the world?" Growth and prosperity: Statistics Canada has reported that our GDP shrank last November, while Bank of Canada Governor Stephen Poloz projects the oil market crash will put a large dent in Canada's GDP growth for this year, and cost both provincial and federal governments billions of dollars in revenue. Harper's decision to bet Canada's economic future on oil appears more foolhardy with each passing day. When the government's multi-billion dollar tax-cut plan for the wealthy is factored in, the likelihood of the government fulfilling its promise to balance the books is up for debate. No matter how you slice it, Harper has failed to lead Canada towards a sustained economic recovery from the financial crisis seven years ago. It doesn't matter how much public money he spends on ads claiming otherwise. Facts are facts. So, what does a government facing re-election do when its top agenda item, economic management, is in tatters? It changes the channel to something else, something that plays into the anxieties of Canadians and helps them forget about the Harper government's shortcomings on the economy. Enter terrorism. A recent Nanos poll has found that 66 per cent of Canadians believe we are war with terrorists, and the prime minister wants to tap into that sentiment. The subject matter may be different, but the prime minister's strategy for owning the national security file is the same as with the economy. Hammer home your message, no matter how inaccurate, and hope voters lose sight of the facts. This means passing unnecessary anti-terrorism laws. This means putting out "24/7" videos that build up the prime minister's anti-terrorism image. And it means acting like a tough guy in front of Putin. But as with the economy, the gap between the government's messaging and reality is immense. The government has been shortchanging our national security agencies and mismanaging their affairs. The Canadian Security Intelligence Service and the Mounties, two agencies at the forefront of Canada's counter-terrorism effort, have seen their expenditures drop over the last several years. Harper claims that his management of national security is "intelligence led," but then why did he make the blatantly contradictory decision to lay off 180 intelligence officers from the Canada Border Services Agency? Canada's military is also reeling from Harper's austerity. Between 2012 and this year, the government has acted to cut the Department of National Defence's budget by $2.1 billion. One of the results, according to CBC News, has been up to a 61 per cent drop in the operations and maintenance budgets for military brigades. That means huge cuts to training for our troops. Major military procurement projects essential to Canada's future security are going off the rails. A credible plan for replacing the country's aging fleet of CF-18 fighter jets has yet to be put forward after the botched F-35 sole source procurement. Yet, another refit of our current fighters will be required as a result to bridge the gap until the new fighters are ready. The prime minister's 2006 plan to procure unmanned aerial vehicles for the Air Force hasn't gone anywhere in almost a decade. Efforts to provide our Navy with Canadian Surface Combatants are off schedule. In 2006, Harper promised Canadians new joint supply ships to replace our near half-century old fleet. It's been nine years, and he hasn't signed any construction contracts. Promises of new marine helicopters, arctic naval ports, and close combat vehicles are all being broken as well. You get the picture. In a panicky response to the loss of John Baird, Harper just moved his most trusted lieutenant, Jason Kenney, from dealing with economic development to the defence portfolio. But without a radically different approach to management, the appointment is the same as putting lipstick on a pig. Let's not forget about foreign aid, which plays an important role in helping stabilize chaotic parts of the world that terrorists often originate from. Harper has cut that as well. While spending on foreign aid represented 0.34 per cent of Canada's GDP in 2010, it now only represents 0.27 per cent. With his heightened focus on national security, the prime minister is trying to change horses midstream following the derailment of his economic agenda. He hopes that enough image-building and messaging on terrorism will fool Canadians into forgetting about his many failures. The question is whether voters will fall for it.